** New Year’s week 5 nights up to 6 guests $2250. Huge windows across the lounge and dining area offer uninterrupted panoramic sea views from Granite Island to The Bluff. Downstairs is the 2nd living area with fabulous seafront views. There are 3 bedrooms each with a King bed, there are 2 bathrooms, the upstairs en suite bathroom has a shower at floor level, the downstairs shower is above the bath. The front balcony is a beautiful spot to start the morning while you sip your coffee and read the newspaper, in the evening you can enjoy drinks with your friends. The spacious rear deck has a large table, quality dining chairs and a BBQ. Seafront on Franklin Parade, Victor Harbor’s premier seafront location. Wonderful panoramic sea views from Granite Island to the Bluff. WINDOWS: To minimize the glare & reduce the heating and cooling impact on the environment all windows are tinted. If for any reason you need to wash any of the windows on the inside the tinting will be affected if you use anything other than water and soft cloth only please. Undercover parking for 1 car plus additional off street parking or 2 cars. All linen for the bedrooms, bathrooms and kitchen is supplied. Please bring your own beach towels. Large enclosed rear yard . In the interest of all guests and our precinct residents, South Australian City Coast & Country operates a strict “Zero Tolerance” and “No Party” policy. Noise from any source within the common areas of the building or the apartments or balconies must be kept to a reasonable level and must not disturb other Guests or Residents. Any infringement of these rules will result in immediate eviction from the property without re-imbursment of monies paid. facilities to rate 4 stars. Seafront at Victor - VICTOR BEACH HOUSE is situated on Franklin Parade Victor Harbors premier seafront destination offering magnificent uninterrupted sea views. 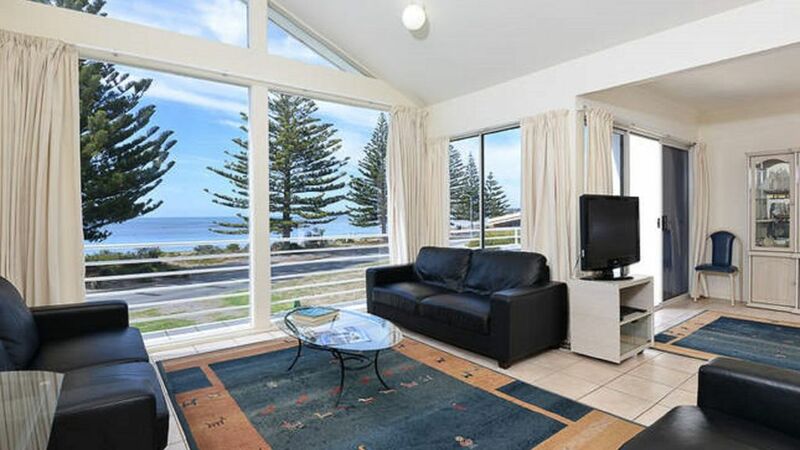 VICTOR BEACH HOUSE is within easy walking distance of the centre of Victor Harbor and over looks the magnificent Encounter Bay. Choose how best to spend the day, swim, surf, watch the waves roll in, watch people saunter along the walking trail and on the beach, visiting a winery, or a seaside restaurant for wonderful meals prepared using local produce, go dolphin spotting with Big Duck Tours ( on line bookings are essential to receive 10 % discount for guest staying at VICTOR BEACH HOUSE ) , take the famous horse drawn tram to Granite Island, maybe walk back to the mainland and reward yourself with an ice cream. Fabulous dining at the The Flying Fish , Port Elliot or Eat @ Whalers ( best to book at both places) or play golf on one of the many beautiful golf courses. Feedback tells us the most popular thing to do at VICTOR BEACH HOUSE is not too much at all,... just let the world meander by while you keep an eye on the waves rolling in and the moochers wandering along the foreshore or on the walking path which runs around the bay. Had a fabulous weekend 'down south'. We had a leisurely drive from Snowtown and called at Alexandrina Cheese Co. on the way through. Arrived In Victor at about 3p.m. Friday and made our way to Victor Beach House. Accommodation and location were fantastic. Thanks so much for the brekky provisions, a lovely and unexpected surprise (good old fashioned country hospitality!). Dropped back into town for a much deserved beer at Anchorage while Sharee went shopping we and headed back to Beach House at about 7.30 for a great curry. Woke up to drizzly rain Saturday morning but headed to markets shortly after breakfast. Had a yarn to a few of the vendors and bought some goodies before walking down to the foreshore via the mall and a number of shopping stops. Had a great schnitty lunch at The Crown and wandered up to Coles to get provisions for an evening barbie. Back to Encounter House to enjoy a few beers, footy, snooze, a couple of 'lazy reds' (Coonawarra Cab Sav) and HEAPS of "how'z the serenity?" through the huge glass windows at the front. Early breakfast on Sunday then a slow drive through to Glacier Rock for a nice coffee and chat with the owner. A beautiful spot that we will definitely visit again. Short-cut through to Parawa and then on to Deep Creek and Raywood Nursery. Can't wait for our grand-daughter to be old enough so I can take her back and search for fairies-what a beautiful spot! Scenic drive and visit at Talisker mine then into Cape Jervis for counter meal at the pub. Steady tour back via Normanville, Yankalilla and Myponga with an obligatory beer tasting at Smiling Samoyed Brewery. Had a quick look at Hindmarsh Falls on way home and a lovely evening meal at Anchorage-cosy,warm facility and relaxed atmosphere. Great sleep and final breakfast before some more shopping and coffee at Nino's before heading to Mount Barker for lunch with our daughter and a cuddle with our 7 week old grand-daughter. So glad that we decided on Encounter House-you'll be hearing from us again. FANTASTIC! All linen for the bedroom, bathroom and kitchen is provided at no additional cost. Family size refrigerator with freezer at the top. Encounter House is a spacious, comfortable, well equipped house ideal for getaways with your best friends or your family . Best enjoyed for longer stays winter or summer The fabulous uninterrupted sea views offer the best you want for at the beach. Encounter House has a well set kitchen up with lots of pots and pans, platters, dishes, crockery and cutlery making it easy for you to entertain. A 5 minute drive to Yilki precinct where you will find pasta, fish and chips, fabulous curries and pizzas.and the best bacon and egg breakfast at the Yilki Store. With all these yummy goodies available you can avoid cooking all together :). Yvonne M.Tea Tree Gully. South Australia. We are "return" guests and once again everything was just wonderful. The stunning sea views are mesmerising - no trouble washing dishes at all while staring at the beautiful ocean. Didn't need to use the dishwater as I was captivated by the view. Loved our early morning walks along the foreshore. We'll be back - again!! We had a great stay for 5 nights so close to everything, we were surprised to find the fridge stocked with eggs, bacon, tomatoes, sausages, fresh bread and a bottle of bubbly everything we need was there and a well stocked pantry we had a very relaxing stay. will definitely be staying again. the two living areas were perfect for a family, nice indoor dining area, very close to the beach, excellent views to the beach, nice balcony, reasonably sized backyard, very nice bedrooms. Booking process was excellent and it was lovely arriving to find heater and lights on to welcome us. Magnificent views, good layout and décor and extremely well equipped. Beds were very comfortable and we found it a nice quiet area. Unfortunately the air conditioner was noisy and not effective downstairs which was very cold (we had cold, wet weather). There was no internet connection. The stairs are quite steep and could be a problem for elderly guests. We thoroughly enjoyed our stay at Encounter House. Thank you for taking the time to review your stay at Encounter House. I appreciate your decision to give us a 4 star rating overall As explained on the information page of this site and in the additional information which you received it is a two story property so there are stairs. The air conditioner has been sorted out and by the way we have a new cleaner :) Re there being no free wi fi. Our charges are kept as reasonable as possible, we give our guests a good selection of items in the pantry cupboard, we don't charge for linen hire or for cleaning, so I'm sorry but we simply can not afford to include free wi fi as well. We thoroughly enjoyed our stay here earlier this year. Fantastic Location. We rode our bikes along the esplanade, took a short walk to the park with playground & enjoyed our basketball game on the half-court with the kids. The setup of the house was fantastic for our needs. The kitchen was so lovely with everything we needed. There was plenty of room in the dining & living area for our family & the kids enjoyed having their own living area. We would definitely stay here again, it had everything we desired for a beachfront holiday. The views were Amazing! !